The first real concert I ever went to was outside of Atlanta a couple of decades ago. Tom Petty was the headliner, and I don’t think I’ll ever forget that experience. You grow up with certain songs in your life, and if there was a constant in the 80’s and early 90’s, it was hearing something great by them. Along with some fantastic songs, Tom Petty had his own unique style. From oversized top hats in Don’t Come Around Here No More, normal top hats in You Got Lucky, to outback hats in You Don’t Know How It Feels, Petty loved to sport hats on the stage and in his own life. Below are some great looks over the years. Movies and entertainment have always been a great testing ground for fashion, and we see numerous new looks that emulating the style that we see after various big and small screen debuts. 2017’s Kingsman: The Golden Circle is a sequel to the surprise 2014 hit Kingsman: The Secret Service . In this installment, we see the titular Kingsman travel to the United States to team up with their American counterparts the Statesman as the Statesman seem to be fond of the Cowboy and Western look. Despite a great deal of focus on fashion and style in the original, with a Kingsman hideout beneath the Kingsman tailor shop on Savile Row, we didn’t see many hats in the original movie outside of a few ballcaps and flat caps. In the sequel, we see English director Matthew Vaughn dial up the Americana of the Statesman to 11 with a number of stylish cowboy and western hats sported by Jeff Bridges, Channing Tatum, Pedro Pascal and even Englishman Colin Firth. Check out the video below for the trailer and don’t forget to check out our Cowboy Hat selection to complete your Statesman look. Hats became fashionable for men during the 14th century. At that time, they were used for both formal and casual occasions and were made of several kinds of material, such as velvet, silk, taffeta, beaver fur or felt. 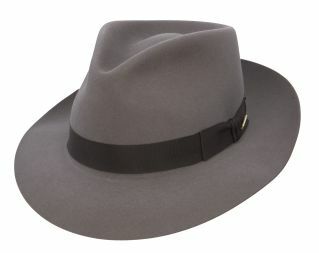 Of those options, felt is the modern fabric from which many kinds of men’s hats are made, most notably the fedora. By the time the 1920s rolled around, the fedora all but replaced Great Britain’s one-time favorite, the bowler, when Prince Edward became partial to a more elegant look. However, as wearing apparel changed from decade to decade and became increasingly casual, hats for men lost their appeal—but Hollywood came to the rescue. Buster Keaton in a pork pie fedora. 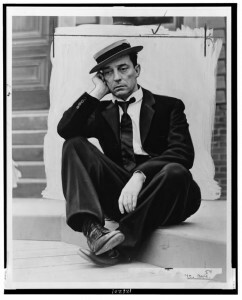 Silent film star Buster Keaton wore his trademark pork pie fedoras in many of his pictures, crushing them into a shape that was perfectly flat on top. In the 1940s and ‘50s, heavyweight actors like Humphrey Bogart and Frank Sinatra were wearing fedoras both in real life and in their movies. Moving forward, Harrison Ford’s character, Indiana Jones, performed all manner of death-defying feats wearing his somewhat battered fedora. Today a younger generation of actors and musicians has helped to revive the wearing of good-looking hats, especially the Trilby fedora with its narrow brim that can be turned up all the way around in a jaunty, casual manner. The thing to remember is that you want your hat to retain its shape, so when you take it off, set it upside down on its crown. This will keep the brim free so that it will not flatten out. You can also put your hat on a peg, but remember not to leave it there for long or gravity from hanging will cause it to change shape. A hat box is the ideal storage container. Keep it in a cool, dry place and add some cedar chips to the box. Not only do they have a nice, rather masculine scent, but cedar is very helpful in keeping moths away. A good hat is an investment, so you will want to keep it in great shape. This begins the moment you remove it from your head: Lift it by the brim, not by the crown. This way, you enable the crown to hold its shape. Keep in mind also, that the oils and dirt from your hands can be transferred to your hat, so handle your new chapeau with clean hands. You can remove loose dirt from your hat with gentle brushing; a horsehair brush is recommended. Dust can be wiped away using a slightly damp cloth. There are professional cleaners that are made for hats, but if your felt fedora suffers a smudge or stain, you might first try cleaning it with the help of a makeup sponge or gum eraser. See our infographic on How to Clean a Hat. People will definitely take notice when you appear in a good-looking hat or flat cap, and you will feel like a new person. A new fedora or homburg may emphasize your manliness and a pork pie may draw out your playful personality. There are many choices to consider, any of which will put you squarely in the midst of the great hat comeback. The explosion various hat-related memes over the past few years have sparked a debate has as to what constitutes a Trilby vs. a Fedora. The fedora became an endangered species towards the end of the 1960’s, and the styles of the 1970’s signaled its death knell. There are many conspiracies as to why its popularity declined, from President Kennedy being the first president to not wear one to the automobile being too small for a head to wear a hat. In any case, reports of its death have been greatly exaggerated. Many people held out and wore hats regardless of the fashion of the day, and since the turn of the century, the fedora has made a reemergence – you see them on professional athletes, musicians, actors, politicians, in style magazines and more. While the hat’s popularity has reemerged, it seems that general knowledge about hat styles, materials, and more has not yet caught up, and the fedora became universally applied to several styles. This is unsurprising as many hat styles are very similar, with just small changes to various parts of the hat, either in size, shape, or material. Simply type in “fedora meme” to any search engine, and you’ll be bombarded with hundreds of images, some funny, some cringe-worthy, and some just outright mean (it’s much easier to sit behind a keyboard and make fun of someone than to have the confidence to go out and be yourself, although we recommend pairing hats with appropriate apparel, utility, occasions and grooming). As these memes started popping up from a variety of forums and image boards commenting on people wearing hats, most were identified as a fedora. And because one of the most popular internet sports is telling someone they’re wrong, comments began popping up correcting the authors that that the hats in question were actually Trilbys. The trilby is generally considered a specific type of fedora (much like a square is a specific type of rectangle,) but it definitely stands on its own as a specific type of hat. A trilby generally has a much smaller brim (sometimes called a “Stingy Brim” fedora), and sometimes a taller crown than your standard fedora. Like a fedora, the trilby has a hat band, usually a ribbon, but unlike the fedora, the trilby has emerged with many more patterns and colors. The brim of the hat is generally flipped up in the back and down in the front. So in general, if you see a hat that looks like a fedora, but it has a very small brim, chances are it can be considered a Trilby. The trilby gets its name from George du Maurier’s 1894 novel Trilby, and specifically from the stage production of the play which used the hat style. At Fedoras.com, we recommend the trilby for individuals who do not have as broad of shoulders, have a skinnier face, and are tall and lengthy. Musicians of late have really embraced the Trilby such as Pharrell, Jason Mraz, and Bruno Mars. One of the modern icons of trilby fashion is Justin Timberlake, who seems to pull it off very well about 95% of the time (we’ll just ignore the 2001 all-denim suit and denim trilby). The fedora is more of a classic look with a much wider brim then the trilby, and made of more traditional hat materials such as beaver / rabbit / or wool fur felt or mixtures thereof. Further confusing the landscape, The Panama (ironically of Ecuadorian origin and popularized during the construction of the Panama Canal) hat is pretty much identical in shape to a fedora, but normally made using varieties of straw. Fedoras traditionally are more subdued and conservative, with earthy tones and colors, and match best with suits and semi-formal wear. This is especially true due to the wider-shouldered profile suit and sports jackets create. Fedoras are not limited to just suits, they also seem to fit archaeologists very well, especially with a leather jacket, a whip. At least if you’re named Harrison Ford. That you’re probably just wasting your time trying to correct people online, so why not grow a little confidence, grab your own trilby or fedora and make an adventure offline. With Spectre rocketing out to a great start in theaters, we thought we’d take a look back at some of the hats in the James Bond movies over the years, starting with Sean Connery. The movie series started in the early 60’s, and as such many of the styles reflect the period. 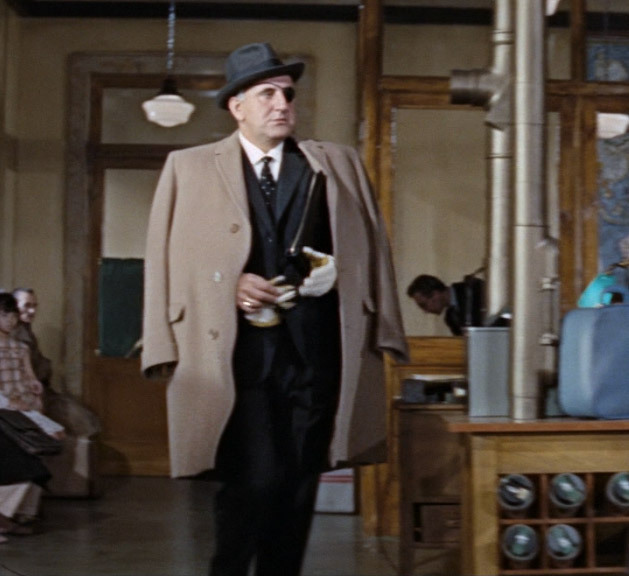 It should come as no surprise that many more hats were featured in the movies of the 60’s than in those today. Sean Connery has sported many hats over the years in his stint in the series. A brown fedora was present for many of the first five movies, starting immediately with the famous gun-barrel opening credits. 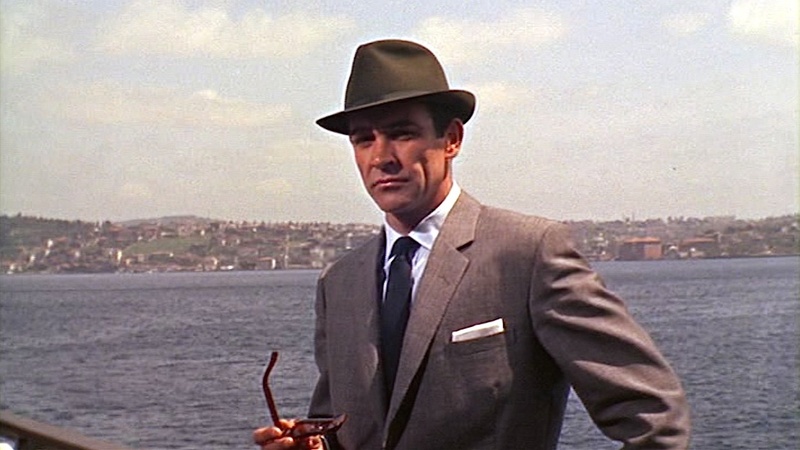 Bond’s fedora has a center dent crown and a fairly short brim, so it may be considered a Trilby style fedora by some. According to The Suits of James Bond, Lock & Co. Hatters provided the fur felt hat for Dr. No., and possibly the next four movies. The hat itself was a dark grey-brown with a grosgrain ribbon hatband. Some similar styles that we have are our Stetson Prof Wool Felt Fedora and our Bailey of Hollywood Blixen Litefelt Fedora (minus the feather). Connery also shows up in a few straw hats throughout his stint, especially in tropical climates. 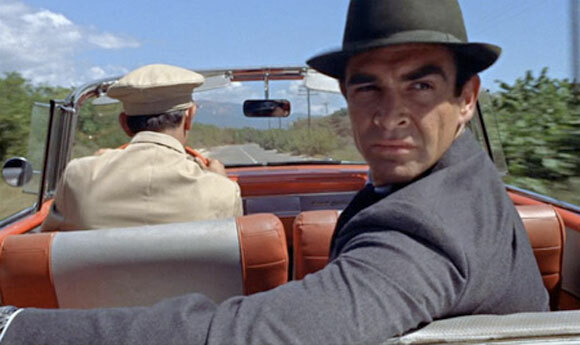 In Goldfinger, Bond shows up in a darker pinch front fedora hat with a dark grosgrain hat band with contrasting stripes. 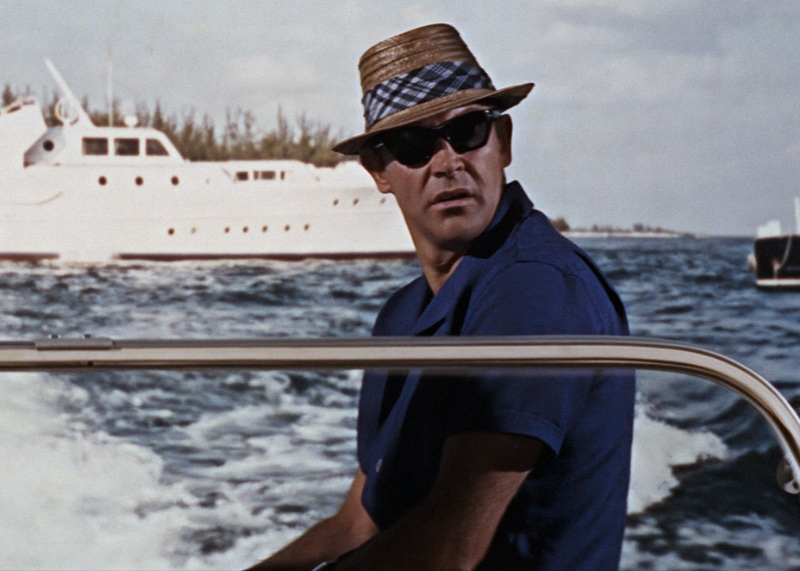 In Thunderball, he shows up in a natural color straw pork pie or fedora with a plaid hat band. We have a few hats available that match both. For the Goldfinger look, try our Henschel Firm Straw Gentleman’s Fedora or our Bailey of Hollywood Salem Summer Braid Fedora. While we couldn’t find a plaid hatband, you can easily make your own and add it to our Bailey of Hollywood Wilshire Braid Fedora or our Coronado Straw Fedora. 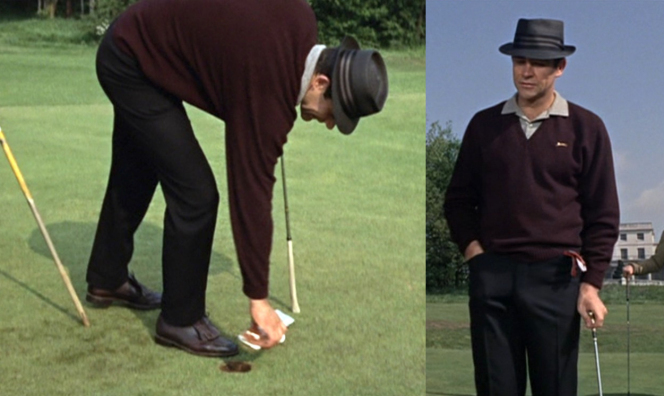 Bond can also be seen practicing his chipping into a homburg at one point. 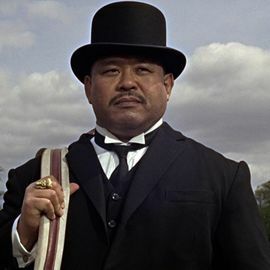 Oddjob is a particularly well known henchman due to his proclivity to throw a razor-edged high-crowned bowler hat. While we do not have any knife-brimmed hats, we do have a number of bowler hats that will suffice. 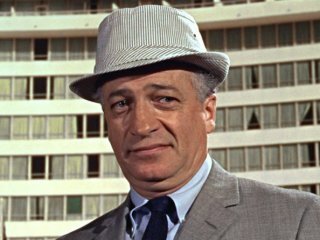 A number of other characters show up in hats throughout the movies, such as Goldfinger sporting a fedora and a flat cap, Felix Leiter in a pinstripe fedora and others. With Jurassic World roaring out to a record box-office weekend, we thought we’d take a look back at some great Jurassic Park hats that have popped up over the years. 1. Dr. Alan Grant (played by Sam Neill). Dr. Grant is a paleontologist who enjoys hunting for dinosaur bones before being hunted himself. He sports a variety of hats throughout the series, mostly wider-brimmed fedoras. 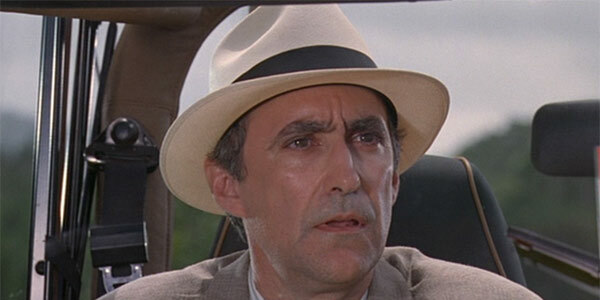 Starting off in Jurassic Park, Dr. Grant is shown wearing a custom-made straw fedora, or panama fedora, with most likely a horsehair hat band with tassles. While we cannot find an exact copy, we do have two hats that are similar, the Stetson Retro Panama Straw Fedora and the Scala Grade 3 Panama C-Crown Hat. In Jurassic Park III, Dr. Grant opts for an olive green fur felt fedora with a black ribbon hat band. The hat is custom-made and looks to be crushable for travel, but we do have a few similar hats, the Christys’ of London Fur Felt Foldaway Fedora in Burma Green and the Stetson Runabout Travel Fur Felt Fedora in Sage Green. 2. John Hammond (played by Richard Attenborough). Attenborough can be seen in many hats throughout his storied acting career, but as John Hammond he first appears in a stylish wide-straw hat with a wide white hat band and a telescope crown (no pinches). We were able to find one hat fairly close in style to this custom hat, the Dobbs Florentine Milan Braid Bishop Pork Pie. 3. Robert Muldoon (played by Bob Peck). Muldoon is the park’s game warden in Jurassic Park, and seems to be one of the few employees who realizes the serious danger everyone in the park could be in at a moment’s notice. Muldoon meets a memorable fate, but is normally seen wearing an outback hat throughout the movie with one side snapped up. 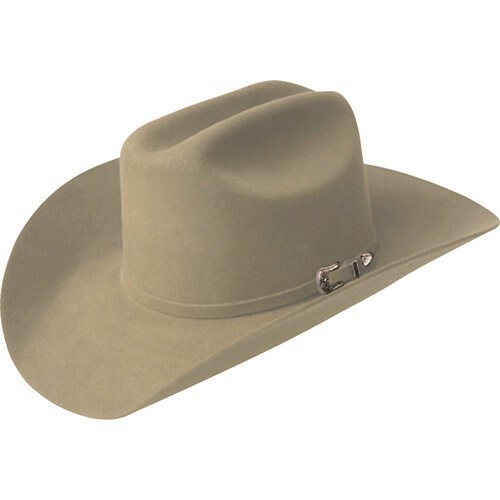 We have found an almost identical hat in our Henschel Cotton Twill Aussie. On the cusp of ‘Championship Sunday’, we here at Fedoras.com thought we’d take a look back at some of the most stylish hat choices in the world of professional football. From historic figures like Vince Lombardi and Tom Landry to today’s stars, each man possesses his own unique flair and uses their chapeau to accentuate their wardrobe. While it’s likely that hats played a role in your casual summer look, it’s even more likely that hats will be incorporated into your style as autumn arrives and the weather gets cooler. Each season we look to our favorite male style bloggers to investigate the creative ways they’re incorporating toppers into their looks. Take a gander at these stylish gents and their summer-to-fall attire — hats included, of course! Baseball caps are casual and practical for any time of year, but we like how Edward of Edward’s Hair chose a heavier wool style, as compared to the typical cotton blend. Rather than pairing his cap with a T-shirt and denim, he opted for a striped button-up and khakis. Check out this Dobbs Recycled Ball Cap for a dressier take on the baseball cap! We can always turn to Justin of Scout Sixteen (our Spring 2013 Man of Style) for a unique, hipster vibe. Here he’s paired rolled denim and a plaid shirt with red oxfords and a pork pie. This Kangol Ashton Braid Pork Pie is a close match. 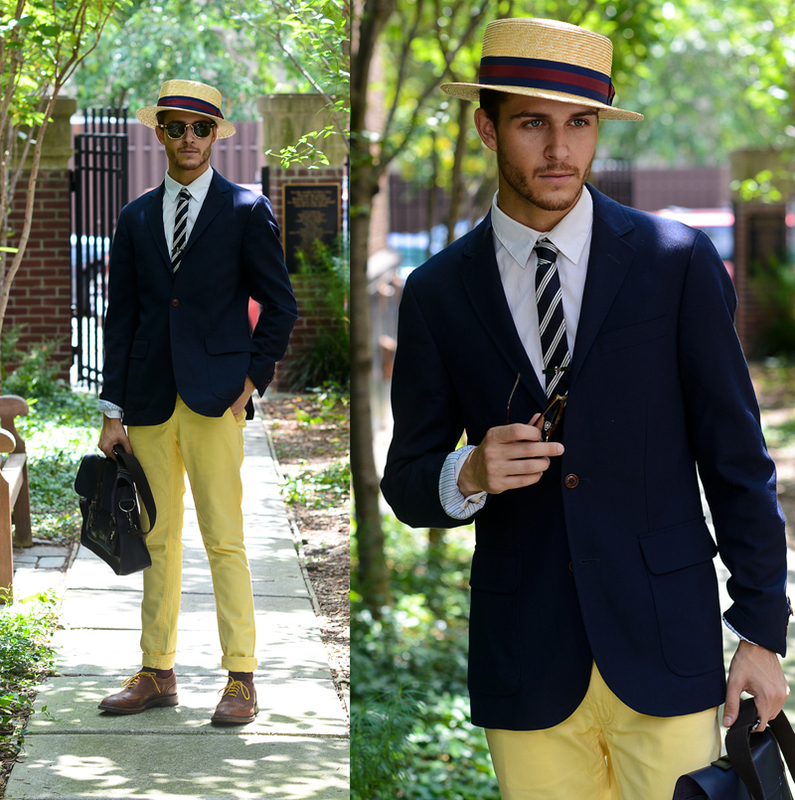 This Gatsby-inspired look by Adam of I Am Galla is ideal for the working man with an eye for style. Again, cuffed denims take the stage (this time in a pale yellow), with a blazer and tie, aviators, and a boater hat similar to the Christys’ of London Hemp Braid Boater Hat. As the season progresses, move away from pastels, and look for pants in darker colors such as rust and oxblood. We love this professional look from Dapper Lou, and we’ve got to say that Lou sure does look dapper! As the season turns from late summer to full-blown fall, you can expect to put on the layers. Simple slacks pair nicely with a belted trench and shirt-and-tie combo. Lou even goes one step further with velvet smoking shoes, a printed scarf, and a fedora like this Henschel Soft Felt Diamond Crown Stingy Brim Fedora Hat. While we all appreciate work-appropriate attire, weekend wear is where we can truly express our style. Another great look by Scout Sixteen, Justin looks trendy (not to mention, comfortable) in simple khaki slacks with laced boots, a printed tee, and a knitted cap like the Bailey of Hollywood Riga Fisherman Cap. Well, we have good news and bad news. The bad news is that this is our last Gals in Fedoras post. We have had so much fun looking at beautiful ladies in awesome hats, and we’re sad to see our series draw to a close. The good news, though, is that we’re ending with another amazing set of ladies rocking some fabulous hats. Today we’re featuring Kailani of Kailani’s Korner and Rosalyn of My Fancy Pants. Both show off their love for summer attire with airy dresses and the perfect complementary hat. We’re still in the thick of summer, so read on to learn how to incorporate a hat into your own summer wardrobe! Where would you wear this look? Kailani: I would wear this look to a morning brunch with friends or even on a trip to the farmers market. What is your favorite way to style hats this season? Kailani: I love pairing hats with a simple outfit such as jeans and a T-shirt or a casual sundress. I think that hats have the ability to turn an old outfit into a fab one immediately. Which of our hats best fits your personal style? Kailani: This question is a tough one, because I am a HUGE hat person. I have an abundant amount, from baseball caps, beanies, and fedoras all the way to newsie caps. But, living in southern California by the beach, I must say that I find myself reaching for wide brim hats that not only make a fashion statement, but keep my face protected while out and about. I am going to have to go with the Raffia Sun Hat with Chiffon Bow. What is your favorite summer hairstyle? Kailani: With the warm weather and my long hair, I rotate between a fishtail braid, a top knot, and beachy waves. Rosalyn: I would wear this look to a spring lunch/brunch with friends or family. Rosalyn: I love wearing hats in several ways. When it’s cooler outside, I like floppy, bohemian style hats to pair with a light sweater or simple top. When the weather is warmer, I love Panama style hats to wear with shorts and summer tops as well as with my swimsuit when on the beach. I also love summer straw hats to dress up my swimsuit while lounging by the pool with my kids. Rosalyn: My top picks are the Two Tone Toyo Wide Brim Hat and the Kangol Heritage Lite Felt Diva. I would wear these all year ’round. Thank you to Kailani of Kailani’s Korner and Rosalyn of My Fancy Pants for speaking with us! We also want to thank all of our readers for following this series from beginning to end, and to all of the style bloggers who made this series possible. We hope you’ve enjoyed our wonderful gals in fedoras! The daytime can be so hectic with work, running errands, making dinner, and fitting in that workout you’ve sworn to not skip this week. The evening, though … that is your time to shine. And who knows better than Kara of Sprinkles in Springs and Jessica of Here and Now? Whether your evening attire is more casual like Kara’s or more dressed up like Jessica’s, a hat can be a fabulous accessory. Read on to get some inspiration from these chic ladies! Where did you wear this look? Kara: I wore this look while running a few errands, before meeting up with friends later that evening. I like that it’s an overall casual outfit that’s really transformed by accessories, one of which being this American Apparel hat. Kara: I’m looking forward to trying out some new hats. 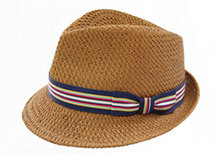 At the top of my wishlist is a straw fedora or a Panama hat in a light color. I’d style it with a flowy dress and some statement jewelry or printed shorts and a breezy, soft Oxford shirt and cute sandals. Kara: The hat that best fits my personality would have to be a floppy hat like the one I’m wearing. I like how effortless and fun they are and that they’re casual while still making a glamorous statement. You can pair one with heels, vintage jewelry, jeans, and a tee, or go relaxed in a maxi dress covering up a swimsuit. There are so many options on how to style one, taking the material into account (felt, straw, etc). What is your favorite summer accessory? Jessica: I would wear this look on a summer evening spent with friends. In the humid Tennessee summer months, my hair tends to take on a new personality, so a patterned fedora is an easy way to look cute and avoid hot styling tools (which are the LAST things I want to be dealing with!). Jessica: Oh goodness — hats are one of my favorite accessories right now! I am still transitioning between my love of bohemian felted hats and fall- and spring- ready Panama-style toppers, but new on the scene is a baseball cap that makes a serious fashion statement! I really love the look of a wide-brim Panama hat set back on the head a bit to show off your hair. Jessica: I would describe my style as classic and feminine, and I would definitely have to go with the Panama hat. Jessica: Braids! I adore a style that keeps my hair off my neck and can be worn in so many ways. Still trying to master the fishtail braid, but the old-fashioned side braid is my go-to! Thank you to Kara and Jessica for chatting with us! Be sure to check back for more gals in fedoras!